Save your search - find out immediately when "Woodrow Wilson" is available at auction! Wilson, Woodrow (1856-1924) Four Typed Letters Signed, 1914-1921. McKinley, William (1843-1901) Signatures of Cabinet Members c. 1900. Wilson, Woodrow (1856-1924) Signed Photograph. 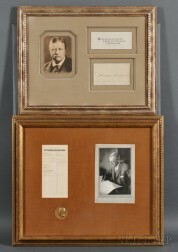 Wilson, Woodrow (1856-1924) Two Typed Letters Signed, 1921 and 1924. Penfield, Edward (1866-1925) Harper's January  Poster. 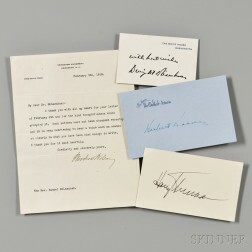 American Presidents, Five Signed Pieces. 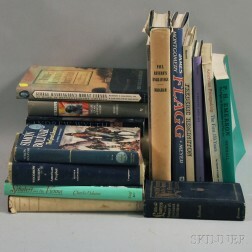 Wilson, Woodrow (1856-1924) A History of the American People, Signed Copy. 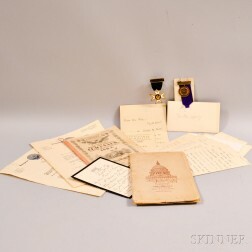 Wilson, Woodrow (1856-1924) Archive Containing One Presidential Signed Letter and Autographs of his Presidential Cabinet. Wilson, Woodrow (1856-1924) Typed Letter Signed, 5 July 1915.